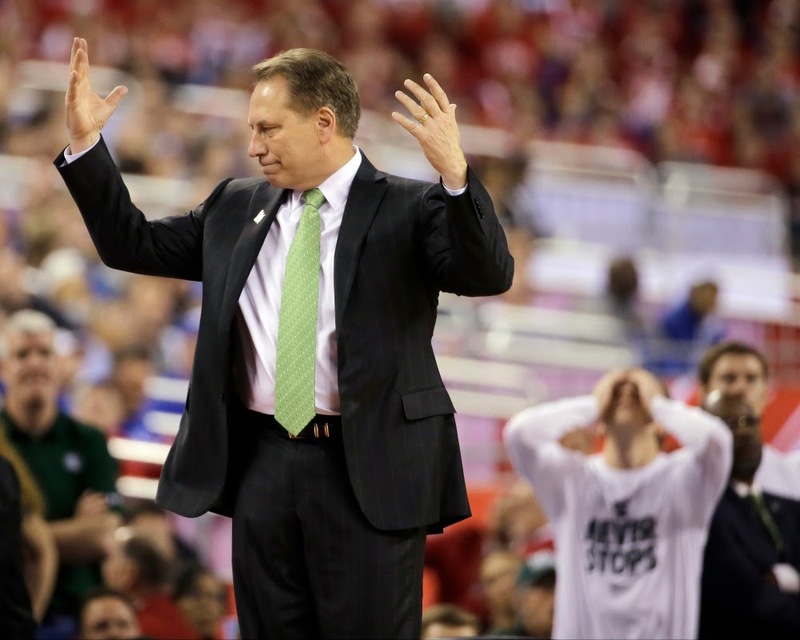 In his swan song game, Branden Dawson was MSU's best defender and it wasn't close. He blocked two shots and helped alter a few others. This could have been a 30-point whooping without Dawson's heroics. His offensive deficiencies were obvious but he absolutely matched Duke's defensive intensity on an individual level. The numbers don't quite do Colby Wollenman the justice he deserves, but he was, by far, MSU's best defender on Jahlil Okafor. Wollenman was in late due to foul trouble (Matt Costello and Gavin Schilling both had four), but when the game was out of reach it was Wollenman who had earned the right to stay on the floor. It's not as if the Costello/Schilling duo was terrible, but while Wollenman didn't force a miss, he did force Okafor to become a passer out of the post. That was a win for the Spartans. Justise Winslow is one guy who Spartans (and most other teams) will be happy to see in the NBA next season. There are few players who improved as much as Winslow this season - on both ends of the floor. He was tremendous against Dawson and whatever other Spartan he guarded, forcing 8 of MSU's 33 misses. If there's one weakness in Jahlil Okafor's game it's defense. Okafor is a decent defender, but much more so when helping from the weak side. If MSU had one of it's solid post players of yesteryear (Adreian Payne, Derrick Nix, Goran Suton, Paul Davis, etc.) it would have attacked Okafor from the opening tip. The results could have been foul trouble or some paint buckets. 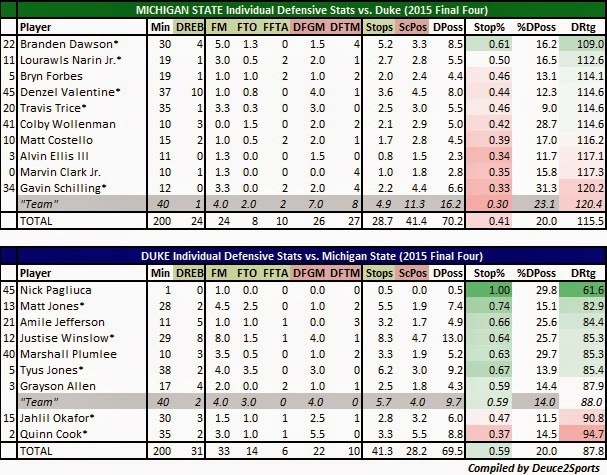 Okafor was Duke's second-worst defender and it wasn't surprising. He only forced 1.5 misses (one was a tremendous block) but he didn't have to guard a serious post threat.